Feature Writer Caleb Couturie will be spending the next six weeks breaking down the 2015 NFL Draft, with focus on Oregon’s Marcus Mariota. Marcus Mariota had a season of legend. His 2014 campaign, highlighted by a Rose Bowl win and Oregon’s first Heisman Trophy, the redshirt junior posted mind-shattering numbers: 4,454 yards passing/42 passing touchdowns/68% completion rate/15 rushing touchdowns/one receiving touchdown – all contributing to an FBS leading 181.7 QBR. Mariota was so good this year that the QB with the next highest rating, J.T. Barrett (169.8), was more than 10 points behind him in that category. Mariota was in the top five players in almost every quarterback statistic possible, and he also led his team to the first ever College Football Playoff National Championship. In short: the guy is ‘desirable’ to NFL teams. After Mariota announced his decision to leave for the NFL draft, and leaving the entire town of Eugene both happy and sad, the questions started coming in. 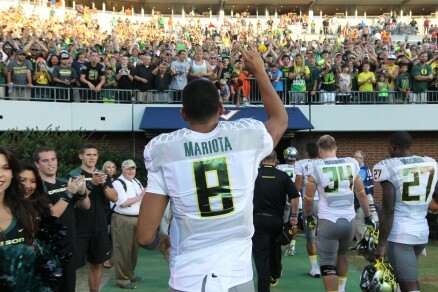 Mariota’s career at Autzen is officially done. Based upon a decade of draft drawings, there is a high probability Mariota will go in the first round, and most likely in the top 10. Based off of draft analysis, and which teams have the highest need for a quarterback relative to their selection order, the likely landing spot is either Tampa Bay or Tennessee, depending on whether the Bucs prefer Mariota or Jameis Winston. However, what this doesn’t include are the other 22 teams in the league who all have to weigh their desire for a QB of Mariota’s caliber. Now, out of the total 32, we have broken down the likelihood of a team having more than a passing interest, and we believe of the 32 teams drafting, seven teams will have no interest in pursing Mariota. The seven — Atlanta, Seattle, San Diego, Carolina, Baltimore, Indianapolis and Green Bay — all have excellent QBs, and those teams also have either new contracts, or are in the early stages of a long term contract. Could Chip and the Eagles take him? For those counting at home, that still leaves 25 teams that have at least a little interest in Mariota. The chances are high that he will be taken with a top pick, however there are a lot of coaches of teams drafting later that may be willing to trade a lot of assets to land Mariota (*cough* Chip Kelly *cough*). Over the next month and a half I will be counting down all 25 by draft order alongside Managing Editor Paul Jones and Editor-In-Chief Natalie Liebhaber. Starting Monday, January 19th, a new team analysis will be released every weekday. We will count down by draft order, so the first one to be released will be the New England Patriots. Check back every weekday to a see a new scenario and a new team for every Oregonian’s favorite Hawaiian.